Powers/Abilities: Superhuman strength (Class 10-25) and durability (bulletproof). Ability to sense and track the energies from the Wizard's Wonder Gloves. He was apparently kept dormant in cold and activated by heat. He gave off some degree of heat, though it was not apparently an offensive ability. 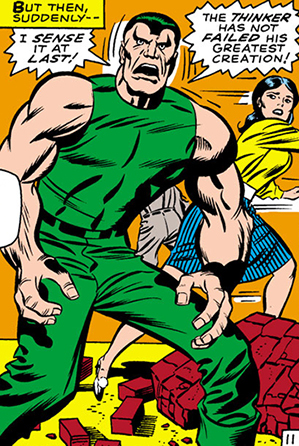 (Fantastic Four I#79 (fb) - BTS) - The Android Man was created by the Mad Thinker, presumably as a failsafe should he be betrayed by his sometime ally, the Wizard. (Fantastic Four I#79) - A group of policemen found one of the Mad Thinker's hideouts. In an effort to catalogue and impound all of his equipment, they opened a box labeled "Don't Open in Room Temperature." Seconds later, the contents of the box, the Android Man, was activated by the heat from the room. Quickly overpowering the cops, he attempted to follow his programming: to track the signal given off by the Wizard's gloves and to destroy the one who possessed them. The gloves were in the possession of Ben Grimm, who had recently regained his human form and was on a lunch date with his gal, Alicia. The Android Man leapt through the restaurant window and attacked the pair. Unable to understand what was going on, the blind Alicia was still holding on to the gloves when the Android Man grabbed her. Ben came to her defense, but despite his fighting skill and above average strength, he was no match for the Android Man. Ben quickly realized that his only chance to stop the Android Man was to become the Thing, but he also knew that Reed had warned him that if he ever changed back, he would be trapped as the Thing forever. Nevertheless, Ben used the Wonder Gloves to send a jolt of energy through himself, and he once again became the Thing. 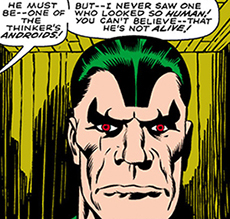 The tables rapidly turned, and the Android Man--powerful as he was--was no match for the Thing, who incapacitated the Android Man with two blows. Ironically, the Human Torch arrived just seconds after the Thing had flattened his attacker. When Johnny reminded him of Reed's warning, Ben walked off, telling Alicia, "Don't let it bug ya, baby! It's--just the way--I planned it! Why should I be a nobody like plain Ben Grimm? When I can be the Thing--forever...!" (Fantastic Four: World's Greatest Comic Magazine#1 (fb) - BTS) - Reed had the Android Man's lifeless form brought to the Baxter Building for analysis. (Fantastic Four: World's Greatest Comic Magazine#1) - When the Enclave--aided by Doom's Robot Guards--raided the Baxter Building for Doom, they reactivated the Android Man. 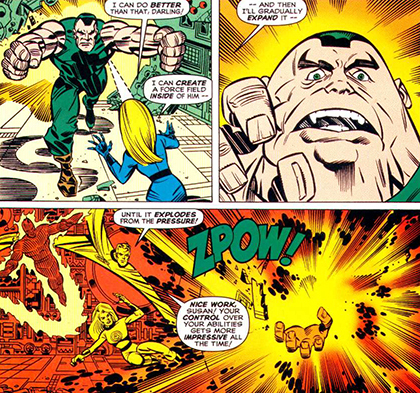 As the Super-Android, it attacked the Fantastic Four when they returned home. The android held its own against their combined power for a short time, until Sue formed an invisible force field within its form, then gradually expanded it until it exploded from the pressure. Comments: Created by Stan Lee and Jack Kirby. Ben actually had a long-standing, and at least partially founded theory that Alicia only loved him as the Thing. If I remember correctly, that dates all the way back to her first appearance, @ Fantastic Four I#8 (or close to it, anyway). A robot resembling Android Man was seen in Reanimator's collection in Wolverine II#149. Android Man has an entry in Marvel Legacy: The 1960s Handbook.